Have you heard of the NEW Crystalens® accommodating IOL technology? Our doctors are now a certified Crystalens® surgeons in Long Beach, California. If you are in the early stages of developing cataracts then reading this material below could make a tremendous difference in your life for years to come. 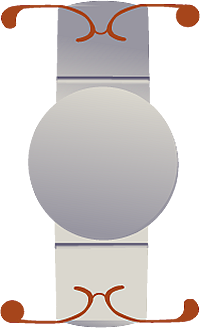 As previously explained on the lens implantation page of the website you now have an option for MONOFOCAL, MULTIFOCAL, or accommodating lens implants. These new implant procedures can drastically reduce dependence on glasses after surgery. Imagine that just for one moment. You can actually spend part of your life glasses free! If you have worn glasses for a long time this could be a liberating experience and this is precisely what our doctors do for their patients. They liberate them from visual problems and hassles so that life is easier to live. These new lens implants are also called premium lens implants but on this page we are going to focus on a premium lens implant know as the Crystalens®. This new and exciting lens implant is actually an accommodating lens implant not a multifocal implant. Our doctors have had tremendous success with this lens and many of their patients are very enthusiastic about their results. How does the crystalens® IOL actually function and fix vision? After the age of 40 people will often start to experience difficulty reading as the eye’s natural lens starts to harden. Prior to this many people often experience excellent vision and are typically confused as to what is happening with their eyes. Because their vision may have been perfect they have never consulted an ophthalmologist as to what is naturally occurring. This inability to see at close distances or difficulty for the muscles in the eye to auto-focus can be very discouraging. This is known as loss of accommodation, or presbyopia. The crystalens was engineered with a hinge design to allow the optic, or part of the lens that you see through, to move back and forth as your focus on an image changes. Are you a candidate for Crystalens? Take our Crystalens self -evaluation survey to help us determine if you would be a good candidate for this IOL implant procedure. Because Eye Physicians of Long Beach is committed to providing our patients with the best in eye care and the latest eye technology we have trained doctors that are certified to implant this new breakthrough IOL. Please take a moment to watch some of our patient videos discussing the very topic. Hear their stories about the lens implant and how their vision has changed. These are real people and real stories. Significantly more patients implanted with a crystalens (88.4%) could see better at all distances then patients implanted with a standard IOL (35.9%). Most could see intermediate (24″ to 30″) without glasses, the distance for most of life’s activities. 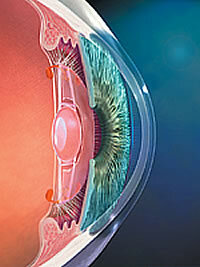 Most patients implanted with crystalens in both eyes could pass a driver’s test without glasses. Some patients did require glasses for some tasks after implantation of the crystalens. Most patients could see well enough to read the newspaper and the phone book without glasses.